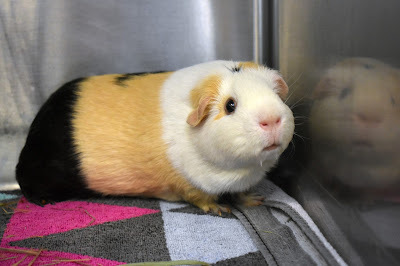 Vanilla (A409032) is a 2-year-old guinea pig searching for a new home. She came to PHS when her owner moved to a new place that does not allow pets. They report she's a very cuddly girl. Vanilla loves to be petted (except under her chin) and sit in your lap. Her favorite snacks include cilantro and grape tomatoes. Vanilla needs regular nail trims and was a frequent visitor to the Pasadena Humane Society Nail Trimming Clinic. The adoption fee for guinea pigs is $10. Stop by our Shelter Shop on the way home to get your guinea pig pellets, treats and timothy hay. Beginning March 22, the Pasadena Humane Society & SPCA is hosting a fee-waived "Sweet 16" adoption event to celebrate the 2018 NCAA March Madness Tournament. Learn more about adopting a pet or sponsoring a pet adoption at pasadenahumane.org/marchmadness. The Pasadena Humane Society serves Monrovia. Whoever adopts please rename Neapolitan!